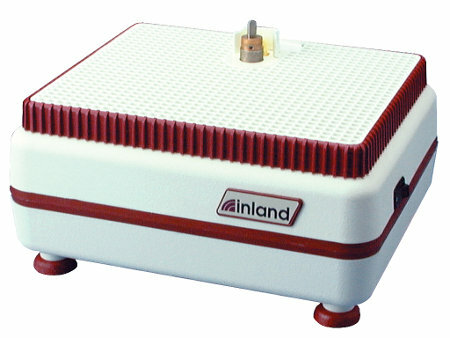 Shaping glass for stained glass projects is probably a task where you want dedicated equipment, so inland makes special grinders like the Wizling CG just for the task. The Wizling’s motor spins at 3500 RPM and produces 16 oz-in of torque so it can use bits ranging in size from 1/8″ to 1″ in diameter or even beveling bits. Coolant is brought to the bit by a coolant feed sponge which draws water from the reservoir. A 9″ x 10″ open-grid, reversible work surface sits in the reservoir which is removable for cleaning. Inland constructs most of the Wizling CG from injection molded plastic. Pricing for the Wizling CG grinder hovers around $100. Hey! I got one of them. A couple things to note. Put it in a box that goes along the sides and back. It sprays crap all around 360 degrees. The optional clear shield is a good idea, too. The ground up glass frit – that part that isn’t on the walls – ends up in the coolant. It’s easier to dispose of the frit when it’s wet so figure on lifting that grate every now and then and using a spatula like tool to dig the wet frit mud out. If you let that stuff dry out you have some pretty nasty dusty stuff to deal with. Microspoic shards of glass can’t be healthy. I hadn’t seen that before but it sure looks like it beats a glass file. Inland and others make several alternatives. Grinding heads are also varied for different purposes. I just saw on being used on Hammered, the Diresta boys made some stained glass, and they used this to clean up some edges. great little tool, I may go get one….